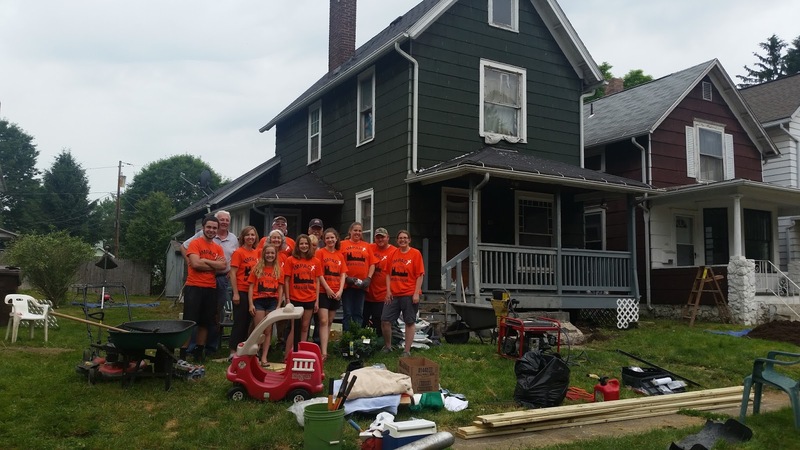 Impact Massillon is a yearly project when the local churches combine efforts to spruce up a run down neighborhood in the city. The leadership team decides what neighborhood will be the target of the effort, probably based on condition, need, and proximity of nearby parking for a large group of people. The churches sign up, and each church is assigned a house or houses to work on based on the number and level of difficulty they sign up for. The homeowners must also sign up to participate. When work day arrives, the street is blocked off to outside traffic. Hundreds of people arrive early in the morning. The sound of hammers, saws, and power tools fills the air. Dumpsters are placed at strategic locations for construction waste, and bobcats buzz up and down the streets, delivering mulch and carrying away yard waste, rocks, broken concrete, and dirt. At lunch time everyone takes a break. The residents are encouraged to join the work teams for lunch, and a brief Bible study is held in order to emphasize the reason for the project: We are doing this to show that God's love is for everyone. We are our brother's keeper. We are meant to follow the commandment "Love thy neighbor" in our own cities in true action, not just in words. Then it's back to work. The projects range from "easy", which would be picking up refuse, redoing landscaping, planting some new plants, and spreading mulch, to "difficult" which could be rebuilding a porch, painting an entire house, or building a retaining wall. Some crews finish their work in a few hours, others take several days. We had a "medium" project which involved some major yard work, cutting down lots of weeds, mowing grass, trimming trees, porch repair on 3 porches, painting 3 porches, removal of concrete steps, building 2 flower beds, and planting shrubbery. It took a crew of 15 (including 11 adults and 4 teenagers) about 8 hours to finish, with the help from 5 or 6 high school boys from a neighboring church. I am especially proud of our young people who worked tirelessly without complaint. I think these types of projects are invaluable in teaching altruism and volunteerism to young people. Our residents, who are renters, did not interact with us too much but the homeowner, who is handicapped and not able to do the work himself, joined us for lunch. It was an awesome experience. We accomplished much in just a few hours. When help was needed, folks from other crews offered advice and manpower. Most of all, a sense of community was formed. It is my hope that the residents of that neighborhood have a renewed sense of being loved and cared for by this community. Billy Graham's latest DVD was passed out as a witness to the reason behind the work. 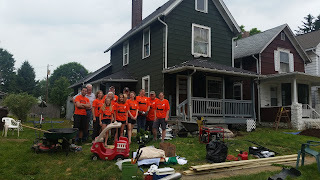 I was a little hesitant, a little doubtful, a little wary to become involved in this project, but I am now glad to say that I participated in "Impact Massillon 2016" and am looking forward to doing it again next year. "Impact Massillon" impacts lives.